Laptops have become a necessity for busy entrepreneurs and flexible working executives with the ability to keep working on the move or between locations being too convenient to pass up. With many of us now juggling between home, the office and travelling to meetings, the portability of a laptop or notebook with all our work on one easy-to-carry device is indispensable. However any Occupational Health professional will tell you that prolonged use of a laptop also has ergonomic limitations and workplace health issues. 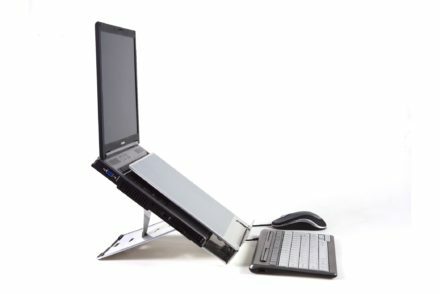 When using a laptop on a flat surface, posture becomes a key health problem as the screen and keyboard being a single unit means that a laptop’s design encourages a hunched over working position throughout the day. The hunched position leads to fatigue and discomfort in both the neck and shoulders. Using a laptop also discourages head movement as a healthy working position can only be achieved by using a raised screen. As well as a range of health problems, laptop users also type slower and less accurate due to the size of the laptop. 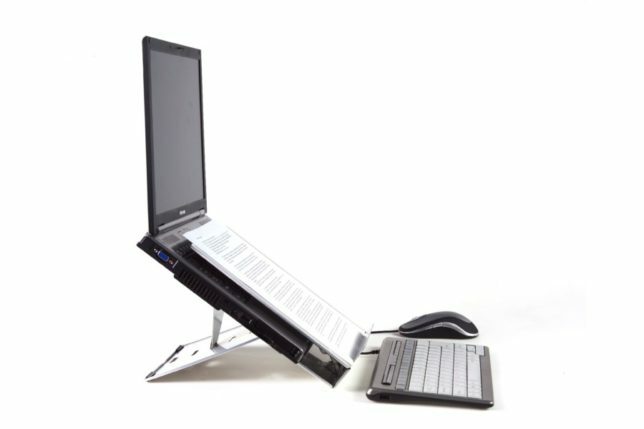 This is where laptop stands like the BakkerElkhuizen Ergo-Q 260 become indispensable… more on that in a moment. Working all day on a regular laptop can not only result in an uncomfortable working position but also leave you feeling in pain and discomfort at the end of the day. Although it is recommended that laptop users only spend up to 2 hours a day working on a laptop, this is not always possible for hard-working entrepreneurs, travelling executives and college students. Luckily, help is at hand from the workplace solutions experts at BakkerElkhuizen who have developed high-end, ergonomic workplace solutions like the Ergo-Q 260 laptop stand that contribute to the physical and mental wellbeing of computer users and allow you to use your laptop for longer. The ideal healthy workspace can easily be created with just a few small adjustments such as the addition of a laptop or notebook stand, along with an external keyboard and mouse. 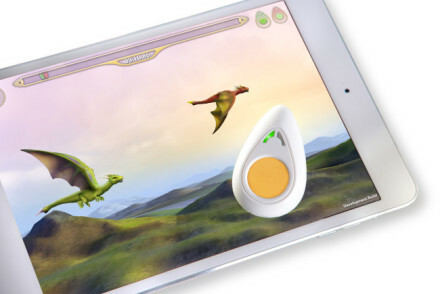 This can increase a computer-based worker’s productivity by 17%. Using these accessories together significantly improves posture as well as reducing neck strain by 32% and improving worker’s comfort by 21%. By eliminating the physical problems caused by a laptop alone, busy professionals can utilise their laptop throughout the day, rather than only for the usual recommended time of 2 hours when using a laptop on its own. 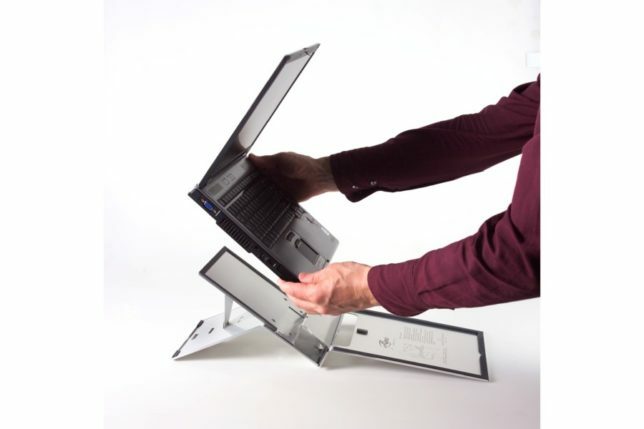 The Ergo-Q 260 from BakkerElkhuizen is one of our favourite portable laptop stands that folds completely flat when not in use making it an effortless solution for busy professionals on the go. It is super light and thin at only 7mm thickness, so is the ideal choice for the busy professional on the go and it easily fits into any laptop bag when commuting to the office or travelling on business. 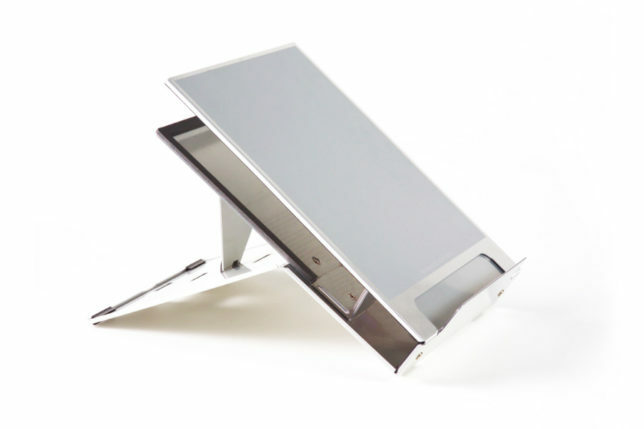 The stand also offers 5 different heights for ultimate comfort, ranging from 9cm to 21cm, which makes it an adaptable solution suitable for both men and women of varying heights. 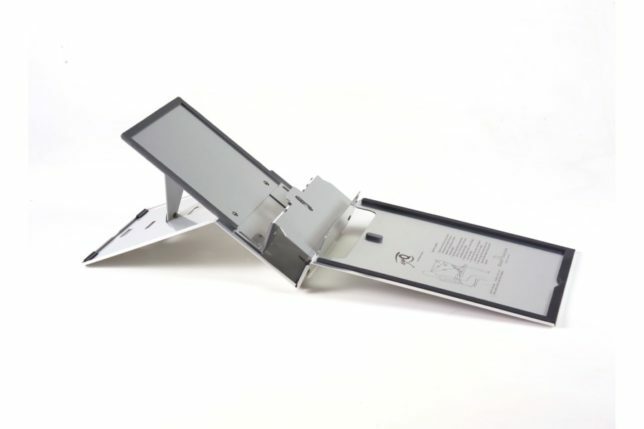 BakkerElkhuizen have also kept workplace efficiency in mind with the addition of an integrated document holder which allows for an increase in data input and productivity. The Ergo-Q 260 from BakkerElkhuizen does more than just hold your notebook or laptop. 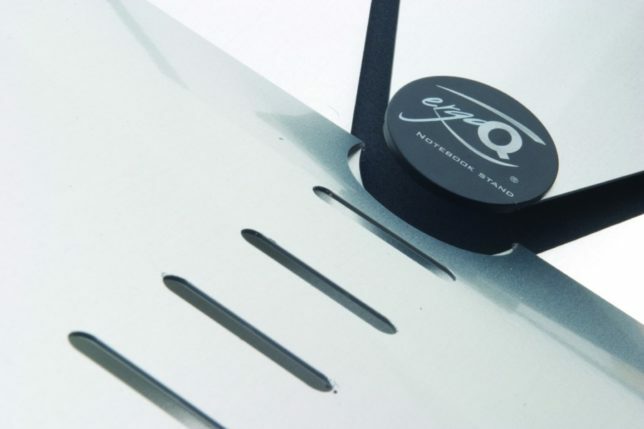 For those who value aesthetics, the Ergo-Q 260 is made from Hylite aluminium giving it a stylish, classy appearance so it’s not only functional but looks great too. The Ergo-Q 260 is the answer to increased productivity and reduced workplace health problems with a thin, lightweight portable design that’s perfect for busy professionals on the go.